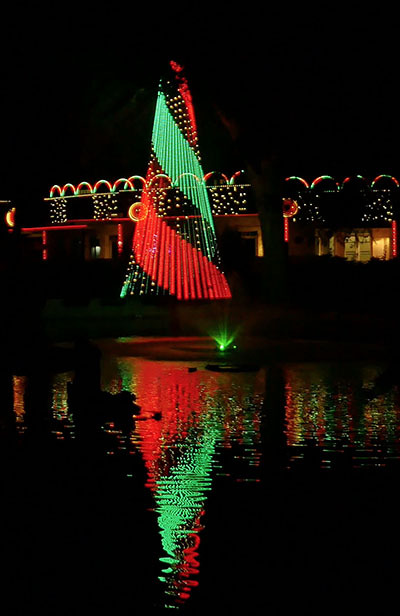 The “Mega Tree” has always been a popular element in Christmas displays due to its familiar iconic form and versatility in displaying a wide array of effects and animations. 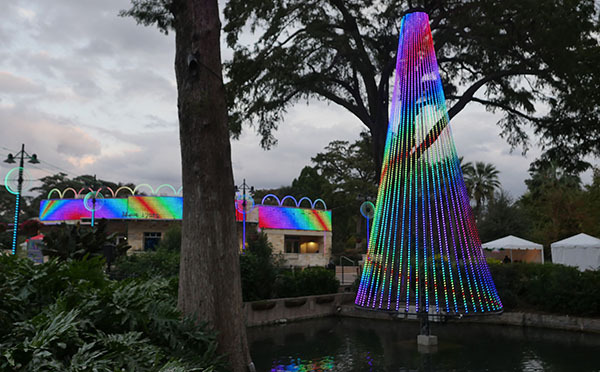 In response to growing demand from our commercial clients, Living Light Shows has designed and engineered a new type of pixel tree from the ground up that meets many of the market demands for today’s attractions. 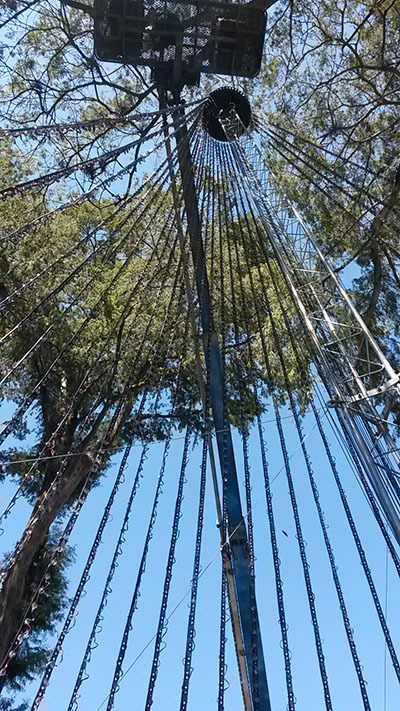 Reaching heights of up to 40-feet without the need for guy wires and creating a system for raising and lowering strands without the need of a lift were key design requirements from the start. In addition, the design centralizes all control and power systems to the base of the tree and utilizes a custom designed mount system to move all equipment off the ground and reduce wire runs and exposure of electronics systems to the elements. The 2″ base ring tube utilizes anchor points to keep strands equally spaced and prevents twisting. CNC cut straps ensure equal spacing up the tree for clean lines and renders a consistent grid spacing for all mounted pixels to ensure effects are not distorted. 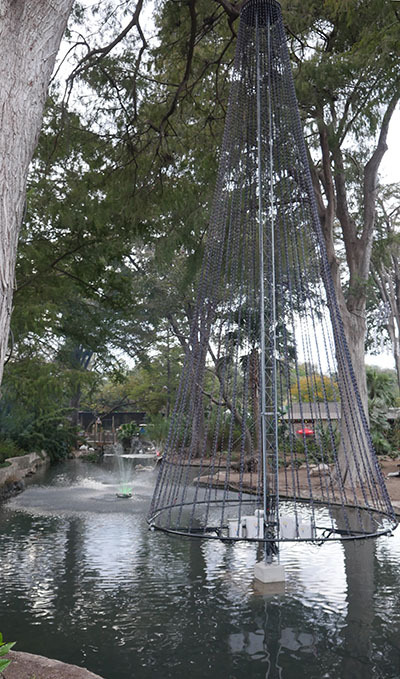 This video of our light show at the San Antonio Zoo shows the versatility and clean lines of our Mega Tree design. 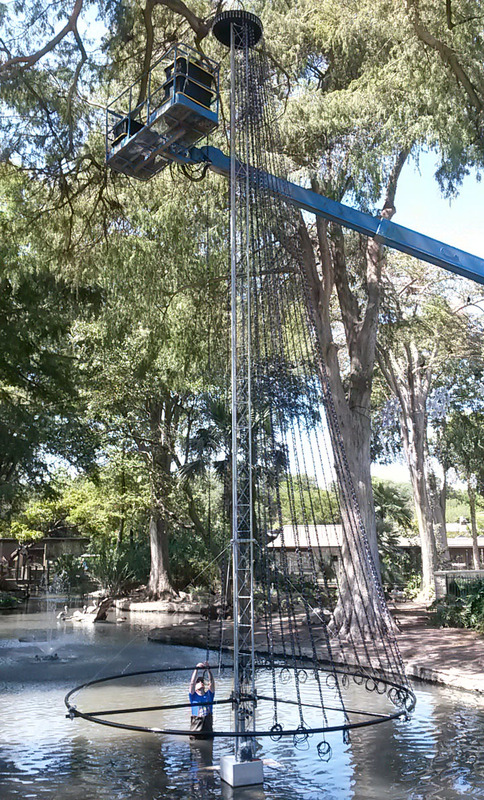 The tree is mounted in the middle of a Lagoon on a custom fabricated 12,000 lb concreate pedestal. This entry was posted in Products & Designs. Bookmark the permalink.